At 29, Joe Garagiola ended a big-league playing career and began a big-league broadcasting career, joining Harry Caray and Jack Buck on the Cardinals radio team. Caray had encouraged Garagiola to make the move, but eventually regretted doing so when the pair had a falling out. In 1955, KMOX in St. Louis became the exclusive flagship radio station of the Cardinals. The 50,000-watt CBS affiliate signed a deal to broadcast the team’s entire 1955 schedule, including spring training games. KMOX hadn’t broadcast a complete Cardinals schedule in 15 years. Caray, Buck and Milo Hamilton had broadcast Cardinals games on a rival station, KXOK, in 1954. 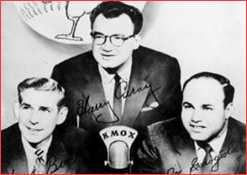 Caray and Buck were recruited to KMOX in 1955. Hamilton was let go. At the urging of Caray, Garagiola replaced Hamilton. Garagiola, a St. Louis native, was 20 when he made his big-league playing debut as a catcher with the 1946 Cardinals. He played in the World Series that year, hitting .316 with four RBI in five games against the Red Sox. The Cardinals traded Garagiola to the Pirates in June 1951. In 1954, Garagiola played in his final big-league season for the Cubs and Giants. In his book “Holy Cow,” Caray implied the Cardinals knew in 1954 that they wanted Garagiola for their 1955 broadcast team. “The third spot on the team was being saved for Joe Garagiola … Once he was done playing, Joe was going to join up with me,” Caray said. When it came time for spring training, Caray and Garagiola went to Florida to do the games. Buck was left behind in St. Louis. Caray, Garagiola and Buck formed the Cardinals’ broadcast team from 1955-59. In 1960, Buck departed, leaving Caray and Garagiola as a duo. Buck rejoined Caray and Garagiola in 1961 and they remained Cardinals broadcast partners in 1962. Garagiola departed to join NBC on its national broadcasts in 1963 and was replaced in the Cardinals booth by Jerry Gross. The Ford C. Frick Award, presented annually since 1978 to a broadcaster for major contributions to baseball, has been awarded to Buck (1987), Caray (1989), Garagiola (1991) and Hamilton (1992). Previously: Think Buster Posey is good? How about Joe Garagiola?